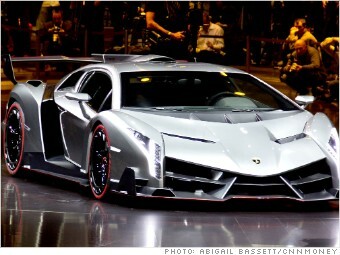 The Lamborghini Veneno will have a 750 horsepower engine and over 220 mile per hour top speed. Italian supercar maker Lamborghini unveiled a new $4 million model - the Veneno - at the Geneva Motor Show Tuesday, but it seems some folk just couldn't wait that long. Images began appearing on the web Monday, before the show opened its doors. Only three Venenos will be sold. If you have your heart set on buying one, we have some really bad news: all three have already been spoken for even before they've been built. The 750 horsepower Veneno is largely based on the Lamborghini Aventador, a 691 horsepower car that sells for about $400,000. Like the Aventador, the Veneno has a 6.5-liter V12 engine, a seven speed transmission and full-time all-wheel-drive. Much of the extraordinary cost of this car comes from its carbon-fiber construction. The entire chassis and outer skin are made from carbon fiber reinforced plastics.